Have you ever been caught in the middle of something really important regarding a particular service on your mobile operator that you wish to access? Its much frustrating when caught in this situation especially when you need that service badly. 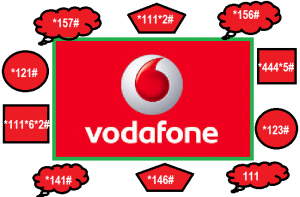 In this post are listed all the necessary Short Codes of Vodafone Ghana. All the codes listed bellow are in full functionality (active) as of the time of this post and is also updated with few changes. The Short codes cover all the way from account balance checking, SOS Credit, Reload code, Checking bundle information, Transfer credit to family & Friends, SIM registration code, Vodafone Red Offers, Checking the registration status of your SIM, Roaming Enquiry, Retailer to subscriber transfers, blackberry Offers, Code to get your mobile number, call center code, down to Recharge code and General News. "Enjoy 5GB data at GHs10 this weekend. Simply send 400 to 5881 to activate." Thanks for share your idea and information. You can see GP Flexi Plan if you from Bangladesh.